Blade production by pressure technique is a marker of a particular craft tradition that emerged in the Mongolian area ca. 20,000 years ago, and spread from east to west during the last glacial maximum, reaching the Baltic Sea and Scandinavia in the Mesolithic. In the north, the population of the final Palaeolithic Swiderian culture of deer hunters, which had developed in Poland on the sand dunes left behind by retreating glaciers, migrated during the Palaeolithic–Mesolithic transition at the turn of the 11th–10th millennium BC to the north-east following the retreating tundra (Terberger et al. 2018), which is evidenced by a centuries-long settlement break before a new populations arrived (Kobusiewicz 2002). Morphological similarities in the tanged points of the East European Swiderian points with Kunda and Butovo cultures supports groups migrating north during the Late Pleistocene / Early Holocene (Zaliznyak 1999). Post-Swiderian cultures developed in particular the surface pressure flaking technology further, and technical differences with Swiderian cultures include single platform cores, pressure blade debitage, inset technology, etc. (Darmark 2012). The culture expanded in the Baltic and in the east European forest zone, north of the (then unstable) Pontic–Caspian area, especially during the Early Mesolithic (ca. 9000–8300 BC) and Middle Mesolithic (ca. 8300–6000 BC), although the earliest date for similar material is currently set at the end of the 11th millennium BC. The Kunda culture developed around the eastern Baltic, from the Polish Plains to the Gulf of Finland; the Butovo culture in the Volga and Oka regions; and the Veretye culture in the eastern part of Lake Onega (Suppl. Fig. 4). During the Early Mesolithic period, human settlement shifted from the major river valleys to the inland lake regions, and changes are seen in the extraction and processing of lithic raw materials, technology, and tool morphology. 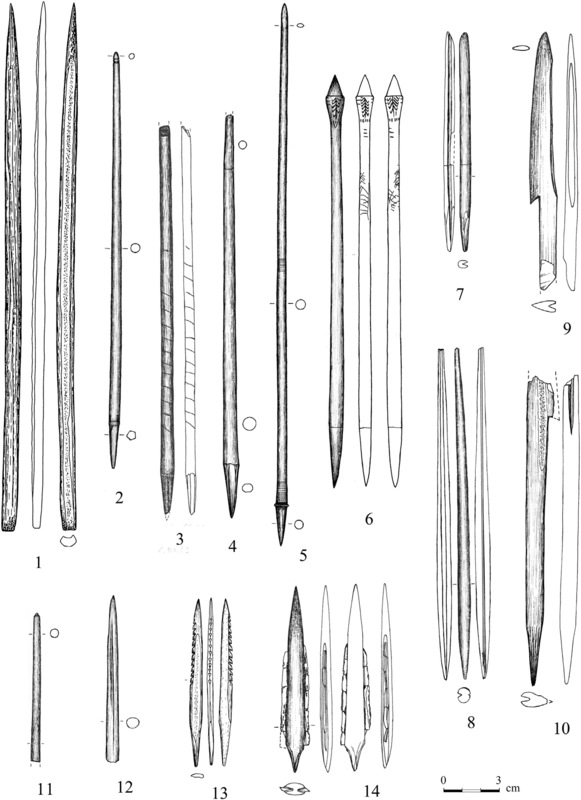 There is a rich bone and antler inventory—harpoons with large, widely spaced barbs, slotted and needle-shaped points, daggers, etc.—and a less diverse lithic inventory—flint end-scrapers and blade inserts, rarely tanged points (Damlien et al. 2018). A typical feature is the use of imported high-quality Cretaceous flint, originating from areas to the south, in the forest zone of western Russia. In the Middle Mesolithic, settlements concentrate in inland lake basins, the most extensively excavated site being Zvejnieki II, in the northern region of the Kunda culture. Compared to the previous period, there is a richer lithic inventory, dominated by side- and end-scrapers, inserts, and some burins, and mainly local raw material is used (Damlien et al. 2018). Mesolithic arrowheads from Butovo (Figure 5) show that they were made using a standard operation chain, with sophisticated technology, and some of them were treated with special care. They were mainly used for hunting, for a short time, but use-wear and traces of repair in some specimens suggest they were used for a long time. These arrowheads show more differences than common traits with Dubensee and Maglemose cultures of western and central Europe. Slotted bone points with flint inserts appearing in Denmark and Scania in the second part of the Boreal period differ in the position and morphology from East European artefacts (Zhilin 2017). Figure 5. Bone arrowheads from the early Mesolithic layer IV. From Zhilin (2017). On the other hand, the technology and typology of early Mesolithic arrowheads from the Eastern Baltic to the Upper Volga area show similarities that indicate regular communication and the existence of social networks among populations of these regions. This is further confirmed by the spread of Pulli type flint arrowheads, some types of retouched inserts, and specific types of flint raw materials. Further developments in technology during the Boreal period show a resemblance between Veretye and Butovo cultures, differing from the Kunda culture, but still with contacts between the regions (Zhilin 2017). The Kunda–Butovo complex is linked together thus by lithic provenience from hundreds of km apart, and by a similar technology. Peat bog sites of the Trans-Urals area also produced bone arrowheads: needle-shaped, narrow flat slotted, one-winged with barbs, paddle-shaped and arrowheads with thickened head, some of them looking very similar to bone arrowheads from Mesolithic peat bog sites of Butovo, Veretye, and Kunda cultures (Zhilin 2017). Although differences in detail can be seen, the transmission and maintenance of the technology require intimate interaction, and, in conjunction with the movement of raw materials, indicate the presence of a social network in the area. The typological homogeneity of assemblages between regions spanning the Baltic to the Ural Mountains led Kozłowski (2009) to call it the ‘North-Eastern Technocomplex’. Further in the Trans-Urals and Siberia, needle-shaped and slotted arrowheads can be compared with similar artefacts from Eastern Europe. Following the French technological approach, along with the concept of chaîne opératoire, material culture such as lithic technology can be argued to represent a manifestation of culturally transmitted knowledge that is learned and shared among a group of people and transmitted between generations, thereby reflecting social traditions. The specific combinations of tehnology (including operational sequence, combination of raw materials, tools, gesture, etc.) are part of a craft tradition, a knowledge and know-how shared by a specific social group. While single technological elements can be transmitted easily within a generation or peer group, complete production concepts are more likely to be learned and passed unchanged through many generations (Damlien et al. 2018). The early successful expansion of haplogroup R1b1a1-P297 (TMRCA ca. 11300 BC) may be associated with the spread of post-Swiderian cultures in north-eastern Europe, linked thus to the North-Eastern Technocomplex and potentially to the expansion of Eurasiatic, whereas the earlier successful expansion of its parent haplogroup R1b1a-L388 (TMRCA ca. 13600 BC) in eastern Europe may have brought R1b1a1-P297 in contact with the disintegrating Swiderian culture. Samples from the Kunda and the succeeding Narva cultures show an ancestry intermediate between WHG (ca. 70%) and EHG (ca. 30%). The earliest samples of Kunda in Zvejnieki during the 8th–6th millennium BC are of hg. R1b1a1-P297, and there is continuity of this lineage until the end of the 4th millennium in the Baltic (Jones et al. 2017; Mathieson et al. 2018). Other samples of hg. R1b1a1-P297 are also found (at least since the 6th millennium BC) in the Volga–Ural region. Subclades R1b1a1a-M73 found in Siberia (see §v.8. Palaeosiberians) and later in Asian populations, as well as the expansion of R1b1a1b-M269 much later from the Volga–Ural area (see below §iii.5. Early Indo-Europeans and Uralians and §viii.20.2. Yukaghirs) support this early expansion of R1b1a1-P297 lineages through eastern Europe into the Trans-Urals area up to the Altai Mountains. The finding of R1b1a1-P297 subclades in modern East Asian territories from Russia, China, or Japan further support the later association of some eastern European or central Asian groups with these lineages.